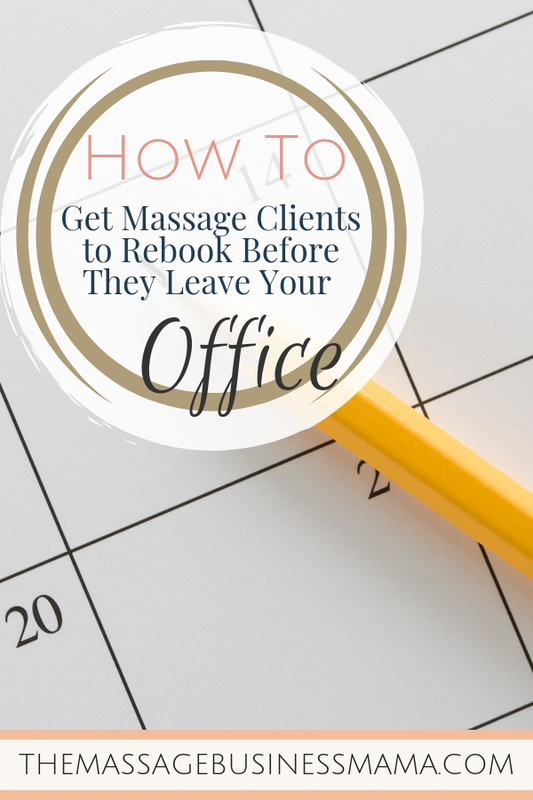 In this Post: Learn how to confidently get massage clients to rebook by simply asking them before they leave your office if they would like to schedule another appointment. Approaching “the ask” with ease. How do you get massage clients to rebook? It’s really quite simple, we ask. Sometimes it can seem like such a tall task to figure out how to have a thriving practice. Getting clients to rebook their next appointment before they leave your office, is the single best way you can keep your schedule filled each and every week. The probability of selling to an existing customer is 60-70%, those are pretty good odds! People may have good intentions of rebooking with you, but get sidetracked with life. I have been meaning to schedule a hair appointment for six months, a dentist appointment for three, and a house cleaner for two. It’s not that I don’t want these things to happen, it’s just that I can’t seem to fit it in my busy schedule to make these appointments. Our clients are the same way. Make it easy for them! Of course, some people will decline. They may not be able to afford it, they may not know what their schedule looks like the next few weeks, or honestly, they may not have enjoyed the massage. If your client states any of these reasons as to why that don’t want to rebook, give them a smile and say, “Not a problem, you know how to reach me.” Then move on. It doesn’t mean they are rejecting you because they chose not to rebook, it happens. If it seems that someone didn’t like your massage, remember that this is okay too! NOT EVERYONE IS GOING TO ALWAYS LIKE YOUR MASSAGES. This is just a fact. Even the most talented therapists have clients that won’t like their style. Now if you find that many people don’t like your massages, you might think about some additional training and some deep self-reflection. But, if it is just a random few people who don’t seem to resonate with your work, try not to take it too personal! It happens to the best of us! I know it can be an intimidating thing at first to go in for the ask! But if you want to get massage clients to rebook, this is what you need to do. I would say that about 80% of my clients rebook before even leaving my office. Not only does this ensure a busy schedule, it also eliminates the hassle of returning phone calls, text messages, and emails. What does this mean? It means a more simplified life for me. Yippee! If you are struggling to make the ask, think about how much this could simplify your life by removing all of your phone calls, text messages, and emails. This reason alone should be enough to get you excited for the ask! 1) You gave them a great massage. 2) They are supremely happy. 3) You know you can help them with their pain management, chronic condition, or athletic goals. We all know the old adage, practice makes perfect. So I want you to get in front of a mirror, I know it seems silly, but you will thank me later. Once in front of the mirror, start practicing the exact words you will use to ask people if they would like to rebook. When would you like to come in again? When would you like to see me next? Do you want to schedule your next appointment? My schedule is filling, do you want to get on the books for next week? I think that you could really benefit from some continued work! My suggestion would be to get two more massages in the upcoming weeks to get ahead of your issues. Do you want to set up some additional times? Are you thinking you would like to book another appointment? When are you free to come in again? Come up with a script that feels comfortable to you. Something that easily rolls off your tongue. Being prepared in this manner eliminates so much of the anxiety you might normally feel going into the ask. Building confidence in this area is necessary to build a sustainable business. Even if you work for someone who is responsible for booking your schedule, it is a good idea to get comfortable asking your clients if they would like to rebook. 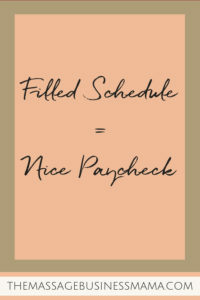 Because you benefit from having a filled schedule. With your new confidence in hand, start keeping track. How many times do you ask for the rebook, and how many times does the client schedule? How many times did you get massage clients to rebook? You are going to be blown away by how this simple act can revolutionize your world!